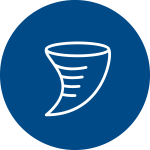 Proceed to the nearest interior room at the lowest level of the building or a designated tornado shelter area and close the door. If at all possible have a phone, radio, flashlights and first aid kits available. Refer to the list at the back of the guide for the list of shelter locations. Contact University Police at 5911/911. If calling 911 from a cell phone, the call will go to the Oklahoma City Police Dispatch. Immediately identify your location as at OCU and you will be transferred to OCUPD Dispatch. To reach the University Police Department directly from a cell phone, call 405-208-5911. Monitor the storm by listening to the radio. DO NOT LEAVE THE TORNADO SHELTER AREA UNTIL TOLD TO DO SO. University Police and Oklahoma City Fire Department will be making rounds throughout campus determining damages and will contact you when it is safe to leave the building. This may take a while, so remain in the designated area until you are contacted to leave. There may be structure damage. Tornadoes have been known to leave the ground and come back down again in a matter of minutes or even as long as half an hour. Remain in the designated area until notified by University Police or Oklahoma City Fire Department that it is safe to leave.